The Right-Sized Tool For The JobWith The Power To Get The Job Done. Perfect for professional service technicians, the new W5130 3/8in. 20V Mid-Torque Li-Ion cordless impact wrench delivers the power you need where you need it. This Ingersoll Rand Impactool offers exceptional performance in a variety of applications, long-lasting durability, and best-in-class power to size for access to tight spots. All metal drivetrain and hammer mechanism robust, durable, and optimized for maximum power and efficiency. Lightweight, balanced, ergonomic handle with patent-pending rubber over-molded grip minimizes vibration, reduces fatigue, and enhances user comfort during extended use. Variable-speed switch with electronic brake provides maximum control of the tool. Patented steel reinforced frame protects against breakage. Tough housing protects against fluids, chemicals, and repeated drops. Compact and durable motor offers optimal performance and long life. From tip to tail allows for greater accessibility and versatility. Compatibility with IQV20 Series batteries Easy-to-use battery interface makes changing the battery quick and simple. W5130 Impactool, Charger, 1 Li-ion Battery & Case. 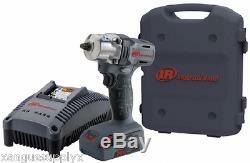 The item "Ingersoll Rand 3/8 Drive 20V Cordless Impact Gun Wrench Kit with Battery" is in sale since Saturday, February 15, 2014. This item is in the category "eBay Motors\Automotive Tools & Supplies\Power Tools". The seller is "xangussupplyx" and is located in Canton, Michigan. This item can be shipped to United States, Canada, United Kingdom, Denmark, Romania, Slovakia, Bulgaria, Czech republic, Finland, Hungary, Latvia, Lithuania, Malta, Estonia, Australia, Greece, Portugal, Cyprus, Slovenia, Japan, China, Sweden, South Korea, Indonesia, Taiwan, South africa, Thailand, Belgium, France, Hong Kong, Ireland, Netherlands, Poland, Spain, Italy, Germany, Austria, Israel, Mexico, New Zealand, Philippines, Singapore, Switzerland, Norway, Saudi arabia, Ukraine, United arab emirates, Qatar, Kuwait, Bahrain, Croatia, Malaysia, Brazil, Chile, Colombia, Costa rica, Panama, Trinidad and tobago, Guatemala, Honduras, Jamaica, Bahamas, Viet nam.